Indians are among the top migrants to OECD nations. Presently they prefer going to new destinations, as per the details released by the grouping of rich nations. Their number for migrating to rich countries of the Organisation for Economic Co-operation and Development has doubled since 2001. 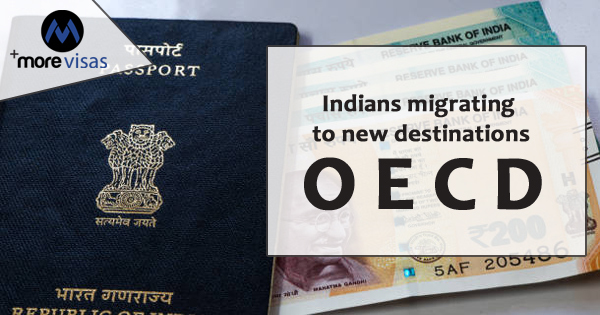 The International Migration Outlook of OECD - 2018, in its recent publication, shows that Indians had the fourth global rank, among migrants to OECD nations during 2016, for which data is available. China, was on top of the list having half a million migrants. This was followed by Romania, Syria and India. Indians accounted for 271,503 migrants to OECD nations in 2016 in comparison to 113,082 in 2000. An analysis of the patterns of migration shows that destination countries for Indian citizens became diverse, in comparison to figures in the past. Earlier, just a decade back, the UK and the US had the majority of Indian migrants. Now, Indians prefer to migrate to Australia and Germany. Actually, Australia had more Indian migrants than any other country during 2016. The share migrants, to the UK and the US, which earlier was, more than half of Indian migrants to O.E.C.D., in the first decade of the present century, has decreased in recent years. In 2016, 37% of Indian migrants to OECD nations preferred these two countries. The share of Canada did not change during the past few years. Canada and Australia today receive more or less similar numbers of Indians. The share of top five destinations the USA, Australia, Canada, the UK, and Germany, declined by 10 percent since 2000, and was 75% in 2016. In general, as per the data, Indians who migrate to OECD nations were 3.8% of all migrants, to this group in 2016. The data has not considered migrants to Lithuania, which is the 36th nation joining the OECD. Furthermore, during 2000, Indian emigrants were 2.9% of all migrants to OECD nations. This share actually was 4.9% in 2010 but fell to 3.8% in 2016. As per the share of the stock of Indian migrants, OECD nations had 30% of total international migration stock from India, which earlier in 2010 was 30.6%, as per the data of World Bank. There is no change in the flow of remittances from OECD nations, over the same period. It shows one third of remittances to India, as per the data of World Bank. However, there is a change in the country-wise share of remittances. The US continues to account for 50% of OECD remittances, and the share of UK in 2017 is 16.9%. The share of Australia to India increased by 2.6 percent and is now 8.3%, owing to the excessive flow of immigrants. Additionally The OECD data shows that Indians were on top of the list of nations, whose citizens obtained the nationality of an OECD nation, during 2016. The US and UK, remain on top the list of nations, where many Indian migrants obtained citizenship; but their dominance is presently on the decline. Furthermore, the share of Indian immigrants, obtaining citizenship has increased in Italy and Australia. Another interesting fact, is that not all Indians migrate to get a permanent residence/citizenship. Many of them arrive in the OECD nations to get higher studies. Moreover, not all of them get PR Status or citizenship. The data of 2015 also shows that students from India were next only to the students from China, in attending educational institutions of OECD. 2, 23,000 Indians secured enrollment in OECD educational institutions during 2015.